Here's the first in the series called "Trailer Treats" showcasing well done picture book trailers. 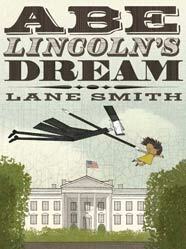 Watch Abe Lincoln's Dream by Lane Smith below. The trailer is effective in the way that it makes the book look intriguing, uses music to create mood, and has simple but interesting motion to bring the pages to life. In case you can't see the video below, go here to see it on the publisher's website. What a well done trailer. Do you know what program most folks use to make a trailer? Marcie--I'm learning about trailers, so I'm guessing iMovie is popular to make trailers.